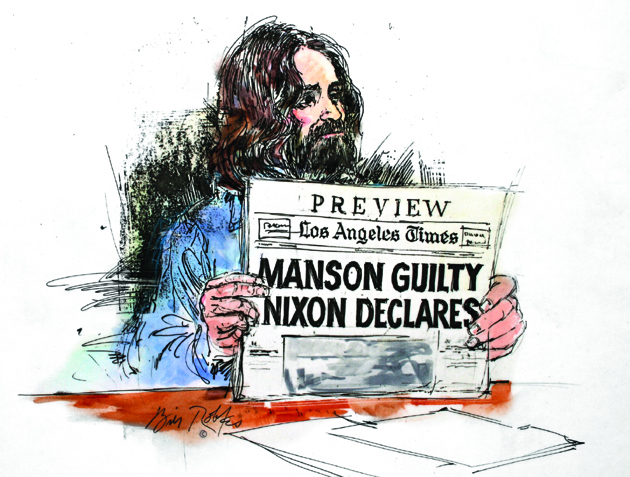 Bill Robles’ iconic drawing and insider story of how murderer Charles Manson came to display to the jury a newspaper headline that read, “Manson Guilty Nixon Declares,” and nearly caused a mistrial is not to be missed in the book The Illustrated Courtroom: Fifty Years of Court Art. By Diane Dimond | @DiDimond | Published on 07.12.2014 5:30 p.m.
OK, by a show of hands, how many readers have actually sat inside a courtroom and watched a trial? Having been assigned to cover countless high-profile trials over the years, I have to admit I relish it. I love going to courthouses with their stately facades and imposing corridors. And inside it’s like watching a big vat of human soup. We all get stirred up together in a courthouse: the poor, the middle-class, the rich. People seeking justice, people in big trouble with the law, people whose families are falling apart. The process is fascinating to watch. Inside courtrooms where the most-watched trials take place, there is a group of unsung regulars that I have never written about — professional courtroom artists. Whenever I can, I try to get a seat next to one of them. Watching them work is a treat. Cameras aren’t always allowed in court (especially in federal court), and so the artist is there as a front-row eyewitness to capture the scene, those special moments that can be shown on television or in print to give the public a real feel for what it was like in the room. Elizabeth Williams is one of these artists, and she has just accomplished something remarkable. After a nine-year effort, she has brought together the artwork of five of the nation’s most experienced courtroom artists in the book The Illustrated Courtroom: Fifty Years of Court Art. It is a delicious retrospective for court aficionados who can’t get enough of headliner trials. The vast collection of iconic art is punctuated by captivating personal stories from all five artists: Howard Brodie, Richard Tomlinson, Bill Robles, Aggy Kenny and, of course, Williams herself. The book begins with the late Brodie’s intricate rendering of the courtroom in which Jack Ruby was found guilty of murdering presidential assassin Lee Harvey Oswald in 1964. Also included is a sketch of Ruby as he heard the verdict. From that time in a Dallas courtroom a half-century ago, the artwork flows like the pages of a legal history book. Among the pages are many other Brodie accomplishments: capturing the action at the Watergate cover-up trial, the Patty Hearst case and scores of others. Tomlinson, also now deceased, was there to see radical Abbie Hoffman on trial for selling cocaine. The artist describes how his long-held philosophy, “to approach each subject as if it is the only chance I’ll ever have to draw them, because it just might be,” came in handy during that 1973 trial. Hoffman skipped bail, changed his name and appearance and didn’t resurface until 1980. Tomlinson’s bold drawings of David Berkowitz (aka the “Son of Sam”) are powerful, as was his portrait of Mark David Chapman (John Lennon’s killer) and he spent two full years drawing participants in the Black Panther 21 case, among many others. Kenny’s water-colored sketches are riveting. 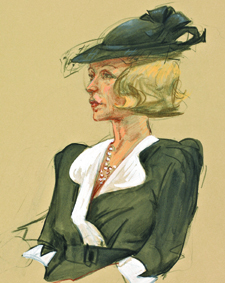 Among her included works are scenes from the trials of Iran-Contra defendants such as John Poindexter and Oliver North. “Strange details sometimes stick with you, and I was very aware of Ollie’s mother wearing a prim bright-yellow hat,” Kenny recalls. Also in the book, Kenny’s drawings from inside the U.S. Supreme Court, Robert Chambers the “Preppie Murderer,” Sydney Biddle Barrows aka “The Mayflower Madam” (another who favored prim hats) and Jerry Sandusky. Her 1974 portrait of James Earl Ray is shocking in his nonchalance as he faced charges of assassinating the Rev. Martin Luther King Jr.
Kenny reveals that another courtroom artist there that day married Ray the next year. Much of the book highlights the work of the talented and prolific Robles, considered to be today’s dean of courtroom artists. Based in Los Angeles, he has covered trials for CBS News for more than 40 years and remembers his first assignment, the 1970 murder case against Charles Manson and his followers, as if it were yesterday. Robles’ iconic drawing and insider story of how Manson came to display to the jury a newspaper headline that read, “Manson Guilty Nixon Declares” and nearly caused a mistrial is not to be missed. Robles’ rendition of the moment Manson grabbed a pencil and leaped to attack the judge graces the book’s front cover. Robles went on to famously capture for posterity the trials of Roman Polanski, John DeLorean, Timothy McVeigh, O.J. Simpson, Michael Jackson and too many others to mention here. Included in Williams’ works are drawings from several dirty money cases including the infamous Bernard Madoff case. Williams was the only artist to render the moment Madoff was led away in handcuffs by federal marshals, and it was seen worldwide. Her works from several mob trials are also in the book along with her personal recollections of each (John Gotti once stood over her and asked in a menacing tone why her drawing of him “wasn’t smiling”) and give the reader a real feel for the pressures on a courtroom artist. As the verdict neared at the Martha Stewart trial, Williams recalls, “The TV networks had their producers in the courtroom with red and black squares of paper they could hold up (on the courthouse steps) to indicate guilty or not guilty.” All correspondents had to do was glance up from their camera position to see the signal and instantly report out the news. The artwork was expected to be finished immediately. For me, this book was a great trip down memory lane and it reminded me what a service these special artists do for the rest of us. They take us inside courtrooms where many have never been. I have to say I would LOVE to sit in a courtroom and sketch these people. It's so interesting. At least Nixon knew he was guilty. HA HA. I was the the jury foremanfor the pillow case bandits. I lied to the lawyers during jury selection. I felt quilty & came clean & they still picked me for the jury. It was interesting, fun & so much better than work it's not even close. I got to say quilty when asked by the judge to about a dozen offenses. Thanks Bobby! I've never been picked for jury duty. What a shock! HA HA. Who are the pillowcase bandits? Is that something horseteeth taught folks how to do? Put a pillow case on someone's head? I wonder what the Three Hole Wonder is doing now? Still rotting in the Maricopa County jail I guess. She's never getting out. Pillow case bandits were a couple guy's from the city coming out to the country & breaking into homes after they caseed them. most placees were elderly people. thank god they didnt catch anyone at home & cause physical harm as they had guns. they were three strike felons so they got life sentences. Oh the pillow case part is that is where they put their loot in the peoples pillow cases. Can I raise my hand and say I have seen a trial or two? Thanks Bobby!! You are sooo beautiful...to me!!! SMOOOOCCCHHH!! My experience has been that most jurors try very hard to by fair and honest, taking their oath serious. While we can all cite a specific case in which we might not agree with a specific jury's decision, when you think about the number of trials underway every single day, and the decisions made, we have a pretty good justice system. My last jury duty was on a Petit Jury which is a 6 man jury. The case was a DUI. The guy wrecked his car and was found passed out at the wheel, His alc blood level was .21. 2nd vote was 5-1 innocent. I was the lone guilty vote but since I had nobody agreeing with me I said loudly LETS VOTE AGAIN! I had no choice but to vote the guy innocent even though he was shitface drunk behind the wheel. It was 7pm by then and I was hungry. They didn't get us any food. I have no idea why it wasn't a unanimous guilty vote on the 1st vote. As Nancy Grace says though: you never know what a jury is going to do. I can only assume that nobody but me and one other person even thought of .21 as being drunk. Thanks Mr. P! I'll bet the Casey Anthony jury was hungry too, thus she was pronounced Not Guilty. Then everyone goes out for a steak dinner. LOL. Mr. P! You should have been the Bizarro Edith and voted guilty until the cows came home!!! But if someone had been hurt or killed I think there would have been more than two guilty votes on the first count. Remember the movie "Twelve Angry Men" with Henry Fonda? Old Henry changed the minds of the other 11 jury members. Well that is Hollywood fiction. You can't sway eleven people on a jury. You can sway a couple but not eleven. Thanks Dill. I've never served on a jury so I don't know what's involved. I guess most cases that jurors served are pretty in and out kinda cases. Only a few serve on high profile cases. I'm reminded of the jurors on the Manson case who served months and months while being sequestered, only to be threatened with their lives. My hat is off to those folks for delivering a guilty verdict even in the face of danger! Cameras were never allowed in court rooms when I was a kid, apparently they are allowed in now in some cases, (if not many cases). She may have been using a needle full of heroin to inject her victims, killing them. Her first boyfriend apparently had heroin in his system when he was found dead. A second man, a Google employee, was found dead on his yacht. The security video, which hasn't been released, apparently shows Tichelman injecting him with heroin. While I don't consider people guilty by their looks, I have to say this woman has a "femme fatale" look if I ever seen one. A vid with some provocative images of her can be seen here--->Alix Catherine Tichelman. Apparently, there was a camera in the courtroom yesterday as Tichelman appeared to try to get her bail reduced from $1.5 million and be released. The motion was denied, the video is--->HERE. Alex Tichelman is going to plead innocent. Her defense will be that global warming killed her victims not heroin. I caught a TV news story about Tichelman a while ago. Her defense lawyers apparently seen the security cam video from the boat where the Google exec died. They said the Google exec used a light from his cell phone and tapped on his arm with 2 fingers to help Tichelman find a vein to inject the heroin. The prosecutors apparently failed to mention that part and I suspect that's why she's charged with manslaughter instead of murder. Also, Warren Ullom, the former lead singer of the pop/rock band The Judies claims the first time he had heroin in his veins it was with an 18 year old girl that may have been Alix Tichelman. Tichelman denies it saying "we never did drugs together". Bizarrely, Warren Ullom is currently serving a 20 year prison sentence for "voluntary manslaughter". He was apparently using heroin with a girl named Rachel San Inocencio. When she passed out, Ullom claims he called his coke dealer to come over and give her and injection of cocaine to "revive her". She died, and 3 days later, Ullom and another girlfriend pawned Inocencio's 3 carat diamond earrings.